(Hanoi, Vietnam) — Right now I’m hiding out in my hotel room as I escape the heat, motorbikes, aggressive vendors and endless ways to spend money that Hanoi is known for. This is by far my favorite big city in Vietnam, but it’s still better taken in small bites than giant gulps. I was out this morning, and I’ll spend hours out there this evening, but for now, it’s nice to be sequestered. I officially have less than a week to go, and I’m in a funny place about it. Part of me is happy to get back to my North Carolina life, as I really cherish my jobs and friends there. Being here reminds me how special it is to feel included in something. Another part of me, however, wants to ride off into the wild blue yonder. My mind keeps replaying the final moments of that early ’90s travelogue flick Captain Ron (really). The feather-light comedy follows a family sailing around the world. In the beginning, they can’t wait to get off their boat. But by the end, they find they can’t leave. When they reach their final destination, which they’ve been talking about the whole trip, they just keep on sailing — and continue farther off the grid. The movie probably isn’t anything to write home about, but I saw it when I was 9, and thinking about that ending tableau still makes me smile. Please understand me. I’m not staying in Vietnam. But being here is a reminder that the world is so big. In my American life, the weeks and months blend together, but here every day is another reality. I love my North Carolina routine, but here I’m busted out of it, and it’s such a pleasure that I’m involuntarily biting my lower lip as I write this. I have this itch, this constant hunger to travel. Even here, I often feel better on a plane or a train than I do sightseeing. I love moving forward and constantly finding somewhere new. Sometimes I feel like I need that to live. I don’t know if that’s a gift or a disability. 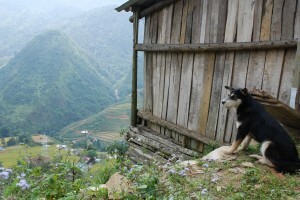 Anyway, I recently returned from two spots: the mountain town of Sapa and the coastal getaway of Ha Long Bay. Both were fairly equal parts incredible and tiring, and at both I felt incredibly lucky, as I have nearly every day of this trip. Tucked away in the far northern mountains, this remote spot was a real mix rustic quaintness and out-and-out touristy capitalism. For visitors these days, the thing is to go “trekking,” which basically means hiking through areas that aren’t completely geared toward it. On the way, you see a world of rice paddies and bright green terraced farming open up in front of you as women from the local villages plead with you to by their handicrafts. To make matters a bit more complicated, you absolutely need them as you slip-slide down slick, muddy hills. Then, when you reach the bottom, you’re so happy to be safe, that you kind of don’t mind spending more money than you should on embroidered purses, earrings and bracelets that you don’t need. At least that was me. 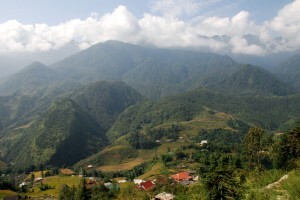 Sapa was one of those places I was hankering to see from the moment I spotted it on a map while on the plane, and I was so strangely pumped up about it that when I got there I couldn’t help but be let down by its introduction. That first morning, after an overnight train ride and a rough bus haul, I ate a mediocre buffet breakfast at my hotel and then was whisked down a steep trail to a little minority village. The place, which had concrete sidewalks and a gift store that blasted traditional music, felt more like one of those living-history villages that recreate the colonial times than a town where people actually lived. I felt sad and ultimately a little responsible for it all, and when our guide sort abandoned us on the walk back up, I didn’t even care. The next day, however, the world was all new again during my soggy 6-mile trek. Maybe it was the sleep, but I felt renewed. My guide, named Shum, was sweet and hilarious, and she kept warning my group not to step in the “buffalo chocolate.” Perhaps best of all, I met Steph and Tyson, Australian journalists I would randomly run into again less than a week later in Hoi An. We talked for hours as we walked through the rain with our ponchos and rubber boots. The scene was so simple, really, just chatting and walking forward through mud and drizzle, but it might have been my favorite time on my entire trip. I can close my eyes and be back there instantly. That night, we slept in a guesthouse in the middle of some remote village. I hung out with the group and listened to tales told by a retired Czech lady and her English husband and tried to learn a new card game. That was unsuccessful, but I did learn I can’t hold my rice wine. I ended up in my mosquito-net-festooned bed sicker than I ever have been. But, strangely, I was still in a good mood. I was in a haze but I still knew that my Vietnam experiences, nausea included, were all mine and would be mine forever. For me, doing nothing usually comes with a side of guilt. I’m not much for kicking back and taking it easy unless I’m in a heavy period of denial (not unheard of). 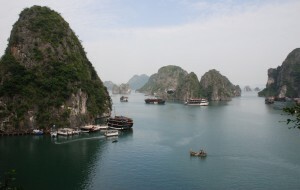 So, I had gone back and forth about Ha Long Bay, a spectacular body of water dotted with craggy rock formations that tourists often use as a backdrop for heavy partying. I figured I didn’t need it, that I could leave that sort of laid-back thing to the folks who were better at it, or were at least looking for it. I thought I was immune to all that touristy relaxation stuff. Like so many other times on this vacation and in my life, I was pleasantly proved wrong. I ended up having a nice, decadent time on a nearly fancy junk I had booked sight unseen. I shared a kayak with an Irish doctor of a certain age and met an American college professor and his bubbly, sweet 12-year-old son. I delighted in the fact that my singleton suite had golden pillows, dark wood and a real shower (not just a shower head angled over the entire bathroom). I didn’t even mind that I had to put in earplugs to drown out the engine at night and that my bill for sodas and maybe two cocktails was $17. I was on vacation, and I felt it acutely. The sole night I spent on the boat, there came a point when nearly everyone jumped off the second floor into the sea. I couldn’t pass that up. The brine was a comforting, almost-warm blanket, the perfect antidote to all the crowded streets and screaming motorbikes I’d been hearing for weeks. Lying back, I was in love with my salt water womb and the quiet darkness that surrounded me. People were talking and splashing not too far away, but I felt delectably alone. For a few minutes, before all my mind chatter and worries returned, my head was wonderfully thoughtless. And I was just there, floating.